Greta and I often have dinner at TGI Friday’s in Southland and then watch a movie, so I was eager to try out the relatively new TGI Fridays at Melbourne Central with a couple of law school buddies of mine. I won’t mince words. The whole experience at TGI Friday’s Melbourne Central was disappointing and we concluded that we will not return. We felt the service was lazy and borderline rude and the food was average. In our view the prices (for example, around $35 for a New York Strip steak) were expensive for what we got and for the same price or a few bucks more we could have received much better food and service at one of the many other steak houses we often frequent. As you may know, TGI Fridays is a chain of restaurants with an American diner theme that offers mostly American, Texan and Mexican food. We arrived at TGI Friday’s Melbourne Central at about 6:15pm and we were seated in an almost empty restaurant. We decided to take advantage of the “happy hour” which includes measures of Johnnie Walker Blue for $10. Ten minutes after ordering, we were told there was no more Johnnie Walker Blue Label. We then ordered three New York Strips two with mushroom sauce and one with pepper sauce. When the steaks arrived the meat was done nicely but my cut (pictured) had a thick layer of fat on the side which marbled into the lean meat. The chips (or fries) were soggy and tasted stale, but upon telling the staff member he simply was not interested. “I’ll pass it onto the kitchen”, he replied while rolling his eyes with a dash of attitude. Then we asked for hot English mustard with our steaks. The mushroom sauce had one slither of mushroom and it had a gluggy texture that was almost flowery and it tasted nothing like mushroom so we did not want it. No hot English mustard was available. Seeded mustard perhaps? No. American mustard? Yes! It took about 30 minutes to arrive but finally came the American mustard which we reluctantly put on our cold steaks. When we finished, up came Mr Attitude to our table to take issue with the fact that we ate the chips that we complained about. He pointed in shock, “It’s all gone!”. Shock horror, we ate the chips after an hour of waiting for the staff to do nothing. We were still hungry afterwards so we had some cold cuts at a bar with whisky. TGI Friday’s Melbourne Central struck us as one of those typical casual dining venues but at premium dining prices in our opinion. The food was average. The service was well below average. To be frank, if we are going to pay around $35 for a steak we would prefer to go somewhere else, pay the same price or a few bucks more, and get a super delicious steak, crispy chips and service with a smile! 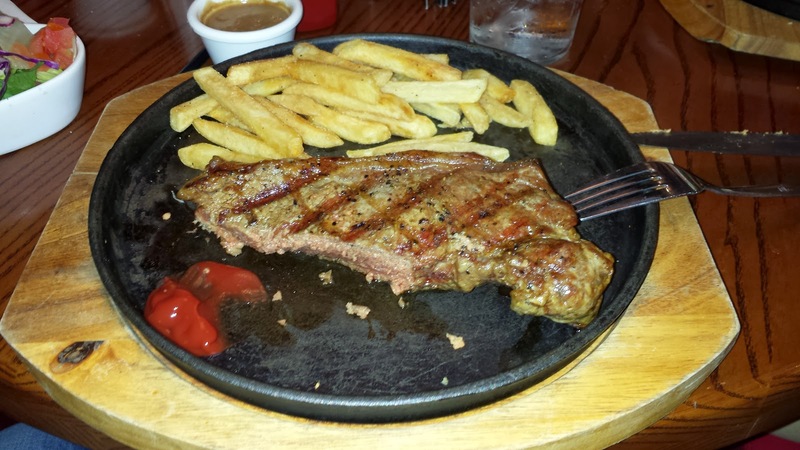 At TGI Friday’s Melbourne Central we got an average steak, stale chips, unenjoyable sauce and service that was slow, unprofessional and borderline rude.